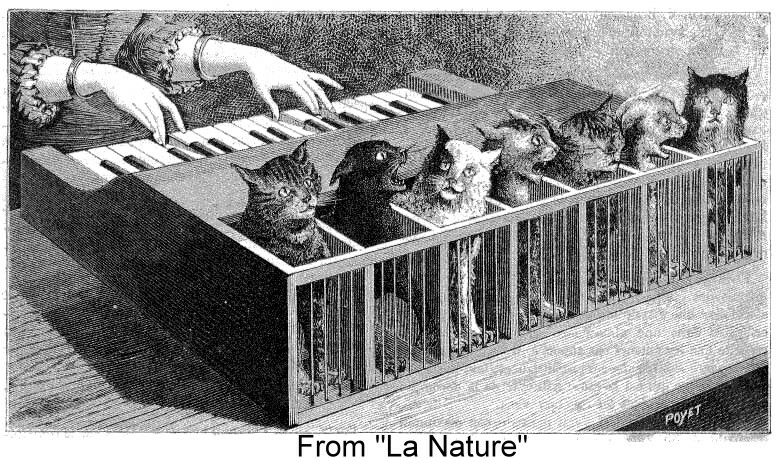 Illustration of a cat-organ, from La Nature (1883). Image via Messy Beast. When I was a kid, my weird and wonderful mother used to amuse us by picking up the cat and pretending to play it like a bagpipe, using its tail as a mouthpiece. Her improvised feline instrument has, sadly, been upstaged by my discovery of the Katzenklavier, a Cat-Piano (also known as a cat organ) dreamed up in the 16th century. This bizarre device was supposedly made by placing cats in boxes attached to a piano/organ keyboard, arranged chromatically by the tone of their meows. Their tails would be stretched out underneath the keyboard, and, when a key was played, a sharp nail underneath would strike their tail, prompting them to cry out in the corresponding note. Poor cats. Luckily, there is nothing to suggest one of these was ever really built, despite the design cropping up several times since at least the late 16th century. 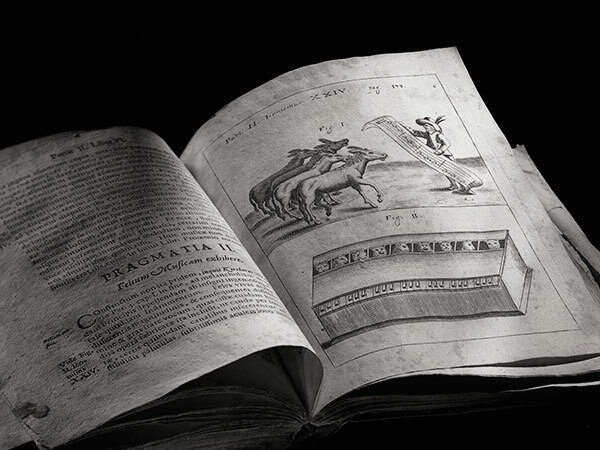 Illustration from Johann Theodor de Boy’s ‘Emblemata Saecularia…’ (1596). Via Robert Rhodes, “Rhapsodies on a Cat-Piano”, Critical Inquiry 24:3 (Spring 1998), pg 701. 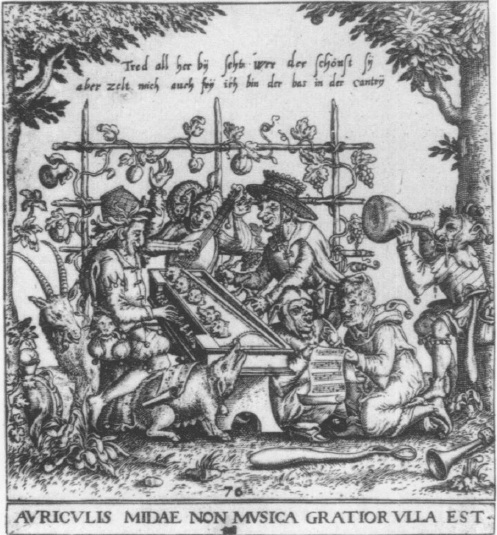 Illustration of Cat-Piano in Gaspar Schott‘s ‘Magia Naturalis‘ (1657). Via Sean Kernan. Illustration of Cat-Piano in Gaspar Schott‘s ‘Magia Naturalis‘ (1657). Via Socks Studio. 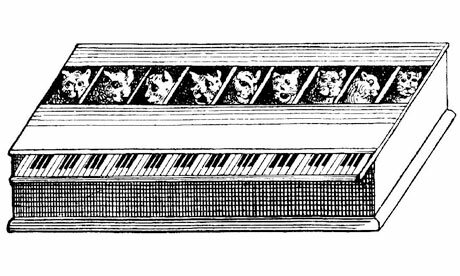 Illustration of a katzenklavier or cat-organ (detail), from Jean-Baptiste Weckerlin‘s ‘Musiciana‘ (1877). And this tradition of Royal amusement lives on: here is a weird video of Prince Charles giggling hysterically over a modern-day (humane) cat organ. But, perhaps more astonishing than its association with royalty, the Cat-Piano also found its way into modern psychiatry: in 1803, German psychiatrist Johann Christian Reil – the man who actually coined the term psychiatry- wrote about he cat organ in his influential Rhapsodies on the Application of Psychological Methods to Cure the Mentally Disturbed (also translated as “disorganized spirits). 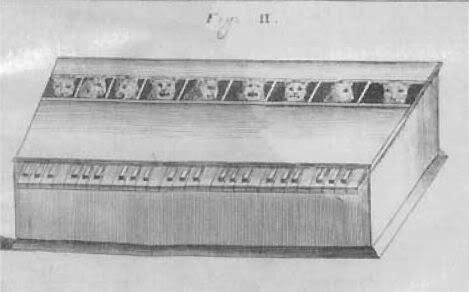 In this work, Reil suggests the Cat-Piano could be used as a tool to shake patients out of a fixed mental state, bringing them back into consciousness of the world. 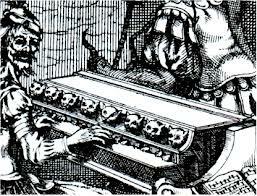 In other words, Reil thought that the Cat-Piano was so bizarre that even insane people could see how insane it is. // Images and information via: Fosco Lucarelli on Socks-Studio, Sarah Hartwell on Messy Beast, David McNamee in The Guardian, and Sean Kernan on Creativity in Photography. See also: Robert J. Richards, “Rhapsodies on a Cat-Piano, or Johann Christian Reil and the Foundation of Psychiatry,” Critical Inquiry 24:3 (Spring 1998), 700-736. (via JSTOR) and Carl Van Vechten, The Tiger in the House: A Cultural History of the Cat, (New York: Knopf, 1920), 195-196. A cat turns the table on the piano. Chomp. it makes me think why whould people want to hurt an animal like that. I remember a skit on either Sesame Street, or The Muppet Show, that had a row of little monsters that were hit by mallets to produce music. I am sure a lot of corporate sociopaths were notably inspired. Terry Jones is a wonderful historian. I have to wonder if he was inspired by the katzenklavier. I wonder if you can get kits for these on-line??? My father used to pretend my cat was a bagpipe also hahahahahaha I thought it was just him. Hahah no way! I totally thought she was the only one too! Reminds me of the human piano in the movie “The Barron Von Munchhousen” it was in the royal bath scene. I’ve never seen it…was it the same design as the Cat Piano but with humans? As a species, we probably deserve it after dreaming up such a contraption for poor cats. I’ve heard of this! No mention of the animated short film? I immediately thought of that, too. It’s a wonderful short (here’s the link: The Cat Piano). What a wonderfully weird post. 1) Those monarchs certainly were sadistic, weren’t they! 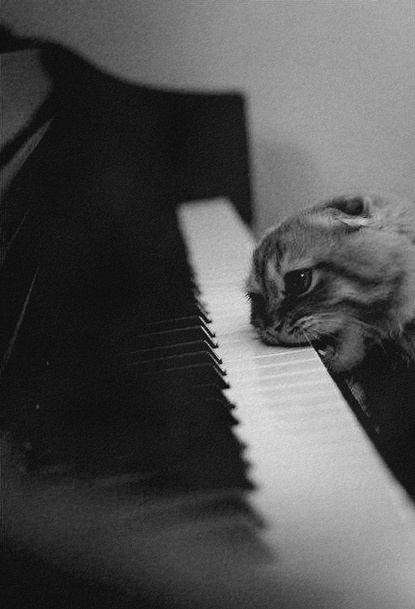 2) The Cat-Piano wouldn’t have had a chance today – PETA would immediately be all over it. 3) Ruth is a legend. Ouch. That is one crazy organ. Weird up your inbox by getting notifications of new posts by email.